A letter from Health Secretary Matt Hancock announcing the news was published on Thursday. The inspections took place after a series of “avoidable” baby deaths at the hospital. 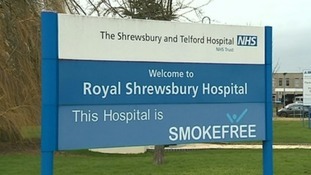 Senior midwife Donna Ockenden was appointed last year to review 23 cases of alleged poor maternity care at an NHS trust. A woman has been charged over the disappearance of a baby boy in Telford, Shropshire. Kelly Mahon, 41, was arrested on Wednesday after the two-month-old infant went missing from a house in the Arleston area of the town. She has been charged with kidnap and will appear before magistrates in Telford later today. West Mercia Police confirmed on Thursday night that no further action is being taken against a 53-year-old woman who also arrested in connection with the investigation. They had earlier confirmed that the missing child was ultimately found "safe and well". A woman who was arrested after a nine-week-old boy went missing from his Telford home has been released without charge. Police confirmed the 53-year-old was no longer a suspect. A second woman, aged 41, remains in police custody after being arrested on suspicion of child abduction. The boy was found safe and well after a police appeal. Two women have been arrested on suspicion of child abduction, after a nine-week-old baby boy was taken from his home in Telford, Shropshire. West Mercia Police confirmed that the boy has been found safe and well, just over an hour after putting out an urgent appeal to find him. They said two local women have been detained and are currently in custody. Police thanked the public for their support which saw hundreds share their appeal on social media. West Mercia Police have confirmed that the missing nine-week-old baby taken from his home in Telford has been found safe and well. The boy is being taken to hospital as a precaution. No arrests have yet been made. A nine-week-old baby boy has been taken from his home in Shropshire. Officers from West Mercia Police were called just before 3pm after receiving a report that the baby had been taken from his home address in Arleston, Telford. The baby was wearing a blue woollen jacket and cream baby-gro which has a teddy bear on the left hand side. Police say the child may be with a white woman who has dyed red/brown hair, and is around five feet, five inches tall. They say she is also thought to have a lump under her nose and a gap between her front teeth. Officers believe she is between 30 and 40 years old, and wearing an army green jacket and small bag over her shoulder. Pictures of items found near a skull and other human remains at a motorway junction have been released by police trying to identify him. 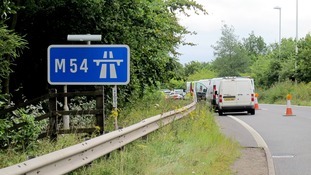 Investigation ongoing after remains were found at junction four of the M54 at Telford in Shropshire.